Succulents and their care are different from annuals, perennials, shrubs, or other greenery. They’re drought tolerant, easy to care for, uniquely shaped, and are able to thrive in places that would likely kill other plants. Whether you’re new to growing these living treasures, or you’re more experienced, some of these myths may surprise you. It’s time to dispel these common myths that keep your plants from thriving. Although succulents are hardy (they’re most definitely hardier than most plants), hardy doesn’t mean they’re capable of handling extreme conditions for long periods of time. Some succulents are hardier than others. For outdoor planting, it is recommended to aim toward hardier succulents since they are able to withstand more. Some good choices for hardy succulents include Sedum and Sempervivum. Many species can handle full sun during the day. This doesn’t apply to all succulents. Most succulents enjoy bright morning sunlight. Afternoon sunlight is typically too hot and harsh. In fact, full, direct sunlight, can harm your plant rather than help it. Full sun increases the likelihood of your succulent leaves burning and killing it. While succulents are considered to be sun-loving plants, be aware how long you keep your succulent in full sun. Some assume that sand is best suited for planting succulents. Indeed, succulents need excellent drainage, but more than likely sand is not the best option. Sand can actually be too draining. When water penetrates the sand, it drains away quickly and the plant will receive very little water. We recommend using succulent and cactus soil. Succulents and cacti are not all one in the same. Most cacti are considered succulents, but there are a few that are not. Not all succulents are cacti either. 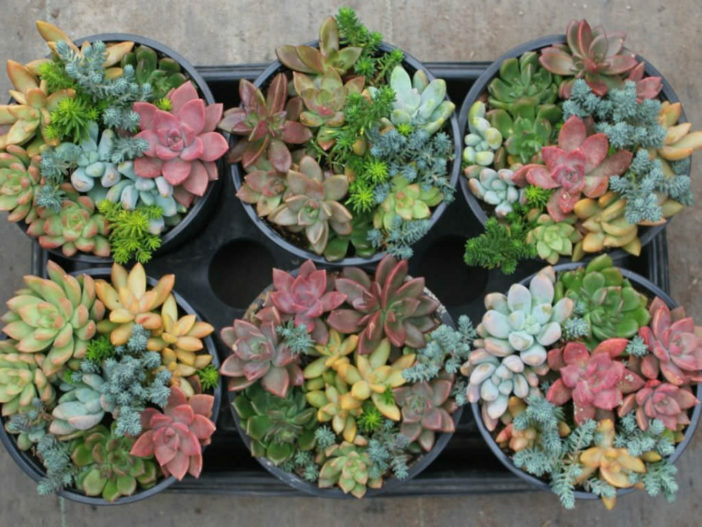 These would include Echeveria, Crassula, Euphorbia, Sempervivum, Aeonium, Sedum, x Graptosedum, and Haworthia. Different succulents call for different care. Most succulents can handle various weather conditions, but they do prefer less humid, sunny weather. They are hardier than other perennial plants in your garden, but they handle wetter and colder climates differently. A harsh winter may cause the plant to freeze and consistent humidity may lead to root rot. Just remember, succulents enjoy a bit of neglect. Many succulents are edible, but be aware of the plants you choose to eat. While many are harmless, some can be toxic to humans and animals if ingested, especially in large quantities. Be conscious of the toxicity of all your plants before exposing them to children or animals in your home. Top dressing is a fun way to add texture and color to your container gardening. Just be careful that your top dressing is not trapping moisture inside the container, which causes root rot. Succulents need fresh air and ventilation. Your plants will not last long in closed terrariums. Moisture has no way to escape allowing mold to enter and your succulents may get root rot. Don’t put the terrarium on a full sun windowsill, as its leaves will burn.